The clocks changed for British Summer Time last night - so here's a Spring clock! Last summer our kitchen clock stopped working - not simply the battery this time. I took the cheap plastic mechanism to pieces - which was very interesting for me, and very irritating for George - but my only conclusion was that it was broken. I discovered I could get a relatively inexpensive replacement module from a local electronics chain store. At some point along the way, I had the idea to make a knitted clock face - not sure where it came from - but here are my ideas in case you too want to create this somewhat over-the-top quirky original. If you want to make the whole body of the clock yourself from scratch then you can buy the mechanism and hands from Maplins (or elsewhere I suspect) either online or from one of their shops for about £5. However, having done this to refurbish my old clock, I found that IKEA sell the entire clock (including mechanism and hands) for under £2. In the end I made a couple of these clocks - using my old IKEA clock and a new one. Here is what I did. First of all - it is very important that the clock face that you knit is not too thick - if it is then it will stop the hands going round. This is because we are using a supplied module where the height of the hands above the clock face is pre-defined. I have not thought of any clever way of increasing the height, so - make sure your knitting is as fine as possible. The hour hand is the one closest to the clock face, and it is also the shortest - so you can cope better with increased texture towards the rim of the clock, for example, to create the markers for the hours, which could be, for example, buttons, knitted bobbles, or embellishments such as rhinestones or silk roses. 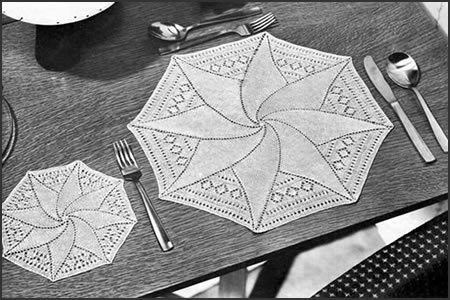 The clock face is knitted from the pattern for the smaller table mat (the pattern for the mats is given in its entirety below). 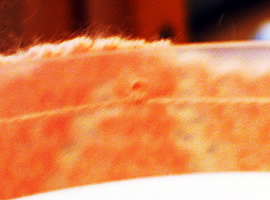 48th round: * P23; turn the work and work back: sl1, k22; turn the work again: slip the first stitch and pass the last stitch from the previous set on the right hand needle over the first stitch; continue loosely casting off the next 22sts purlwise; sl1, k1, psso; repeat from * to end. However, once I had finished, I found the whole thing was very slightly too big. So in the end I had to adapt it to make it even smaller, because I did not want to change to a finer yarn. Carefully take the clock to pieces. The following relates specifically to the clocks I used. The plastic front cover is secured to the outer rim by moulded plastic clips which should be released at the back - I managed to release them easily enough using my thumbnail. I then pushed the front face further upwards from the back using a small screwdriver or steel knitting needle - push at each clip in turn a few millimetres at a time until the front face comes free. Remove the 3 hands by simply pulling (gently) away from the central shank attached to the mechanism. Note that shank is made up of concentric rings, with each hand attached to a different size of ring. The hour hand is the lowest, and sits on the largest ring. Next, remove the clock face. In these budget clocks the face is simply robust paper, and I managed to peel the paper away from the securing sticky tape without damaging it. I turned the paper over to make a plain clock face, and glued my knitted face to it using tacky glue, and left it under weights to dry overnight. Add any non-knitted embellishments to mark the hours, and reassemble the clock. Push the clock face well down on the clock mechanism - add glue in the centre if necessary. Make sure the hour markers are correctly oriented with respect to the way the clock will hang on the wall (ie 12 at the top!). Hour first, minutes next and finally the second hand. Point all the hands to 12 to start with. Push the plastic cover back into place, allowing the plastic clips to click into position. Now you are ready to embellish the surrounding frame of your clock. Here is an opportunity for your own imagination - I knitted a fancy strip, which I tried to glue it (slightly stretched) around the rim edge with tacky glue, holding the surround in place with clothes pegs until the glue dried. However this did not work well and I ended by drilling tiny holes around the back edge of the plastic surround and securing the edge by sewing through them. This is a simple knitted strip, using a technique I learned at a workshop with Fi Morris. It is garter stitch, so the strip is fairly stretchy; it can snuggly form itself around a curved surface, and it has an elegant wavy edge to suit a round "romantic" styled clock. Row 1: K10; wrap the next stitch by bringing the yarn to the front of the work, slip the next stitch on to the right hand needle, take the yarn to the back of the work, slip the stitch back on to the left hand needle; turn the work. Row 2 (and alternate rows): Knit to end of row. Row 3: K9; wrap the next stitch; turn the work. Row 5: K8; wrap the next stitch; turn the work. Row 7: K7; wrap the next stitch; turn the work. Row 9: K6; wrap the next stitch; turn the work. Row 11: K5; wrap the next stitch; turn the work. Row 13: K4; wrap the next stitch; turn the work. Row 15: K3; wrap the next stitch; turn the work. Row 17: K2; wrap the next stitch; turn the work. Row 19: K1; wrap the next stitch; turn the work. Row 20: Knit to end of row (that is knit 1 stitch). Then knit across all 12 sts for 3 rows. Repeat these 23 rows until the strip is as long as you need. My clock was about 30 inches round and I did 40 repeats in 4ply yarn using 2½mm needles to fit around it. I cast on with waste yarn and grafted the sts together to make a ring before stretching it over the clock and glueing in place. 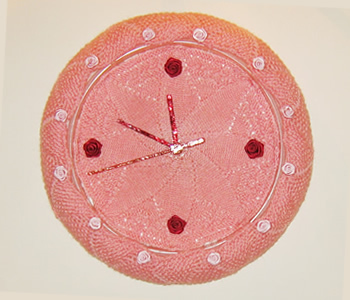 To make the pink clock face I worked the smaller mat using a vintage 4ply synthetic yarn. These are the full instructions for the table mats here (in case you want to make table mats). 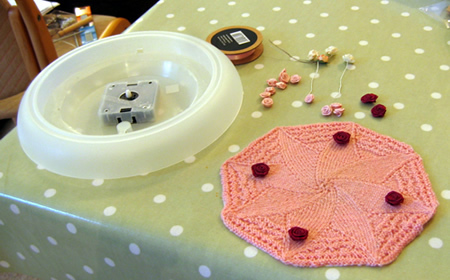 Cast on 8 sts, (2 sts on one needle and 3 sts on each of 2 needles), and join in a round. 1st and 2nd round: Knit. 4th and alternate rounds: Knit. Continue to increase in this manner having one more knit stitch in each repeat until the round 'yfd, K25' has been worked. 54th and alternate rounds: Knit. 62nd round: * P11, k21; repeat from * to end. 64th round: * P13, k20; repeat from * to end. 68th round: * P17, k18; repeat from * to end. 70th and alternate rounds: Knit. 86th round: * P35, k9; repeat from * to end. 92nd round: * P41, k6; repeat from * to end. 96th round: * P45, k4; repeat from * to end. 98th round: * P47, k3; repeat from * to end. 102nd round: * P51, k1; repeat from * to end. Continue to increase in this manner having one more knit stitch in each repeat until the round 'yfd, K12' has been worked. 28th and alternate rounds: Knit. 36th round: * P11, k8; repeat from * to end. 40th round: * P15, k6; repeat from * to end. 46th round: * P21, k3; repeat from * to end. To make the clock face the right size for my clock - using my vintage yarn - I stopped knitting the table mat at this point. Please refer to the additional instructions telling you how I executed the finishing rows for the clock face. 50th round: * P25, k1; repeat from * to end. Damp and pin out to measurements. 2 x 20g balls Coats Chain Mercer-Crochet No 20 in selected colour to knit the table mats. To knit the clock: one 50g ball of fine yarn (3 or 4ply or finer) in your chosen colour. Set of 4 No 14 needles pointed both ends for the clock face or table mats. A pair of No 12 (2¾mm) needles to knit the clock face surround. yfwd/yrn/yon: "yarn forward"/"yarn round needle" /"yarn over needle"; make a stitch by passing the yarn over the needle. psso: pass the slipped stitch(es) over. **A word on the wool. I used a vintage 4ply synthetic mix of "unknown origin" to knit the clock. The side mat worked up sligtly too large for my clock face, so I had to adpat the pattern (see instructions). The recommended Coats crochet yarn would be suitable, and help ensure the clock face was not too thick. This can be very frustrating with lace patterns. If you have any problems with this pattern, do not hesitate to and I will try and assist. I did think that there would be nothing else like this - but as we know there is nothing new in this world. A while after I first discussed the project with Alison, she pointed me at this Clock Tam from Knitpicks.